|*_WORKSHOPS|: I have stopped giving workshops and I am spending more delicious time in my studio. See below for some of my newest work announcement words from Charlie Cummings Gallery. "It's our honor to bring you the delicious ceramics of Lana Wilson. 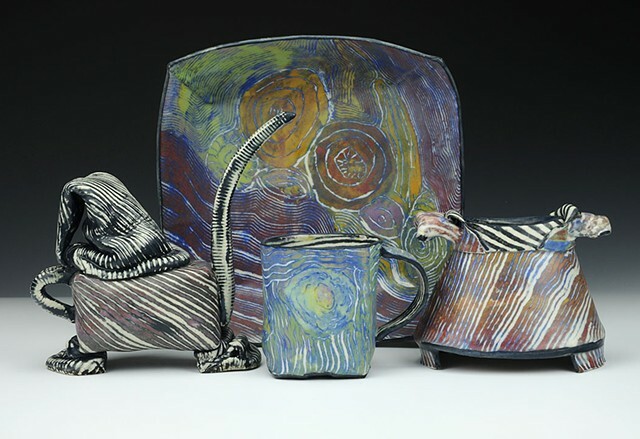 Immediately recognizable, her functional pottery is playful and astute, with a gestural use of color, movement, and rhythm that suggests her education in painting and references symbols from hobo signs to marks that appear on ritual vessels. Her funky, expressive forms use the natural tendencies of clay to slouch and move when pressed and pushed, and her lush surfaces, layered with colored slips and sgraffito, ensure that every angle of these pots holds fascinating surprises.